In the midst of this rising conflict, two rival Cherokee chiefs, different in every conceivable way, emerge to fight for control of their people’s destiny. One of the men, known as The Ridge—short for He Who Walks on Mountaintops—is a fearsome warrior who speaks no English but whose exploits on the battlefield are legendary. The other, John Ross, is descended from Scottish traders and looks like one: a pale, unimposing half-pint who wears modern clothes and speaks not a word of Cherokee. At first, the two men are friends and allies. To protect their sacred landholdings from white encroachment, they negotiate with almost every American president from George Washington through Abraham Lincoln. But as the threat to their land and their people grows more dire, they break with each other on the subject of removal, breeding a hatred that will lead to a bloody civil war within the Cherokee Nation, the tragedy and heartbreak of the Trail of Tears, and finally, the two factions battling each other on opposite sides of the U.S. Civil War. Through the eyes of these two primary characters, John Sedgwick restores the Cherokee to their rightful place in American history in a dramatic saga of land, pride, honor, and loss that informs much of the country’s mythic past today. It is a story populated with heroes and scoundrels of all varieties—missionaries, gold prospectors, linguists, journalists, land thieves, school-teachers, politicians, and more. And at the center of it all are two proud men, Ross and Ridge, locked in a life-or-death struggle for the survival of their people. This propulsive narrative, fueled by meticulous research in contemporary diaries and journals, news-paper reports, and eyewitness accounts—and Sedgwick’s own extensive travels within Cherokee lands from the Southeast to Oklahoma—brings two towering figures back to life with reverence, texture, and humanity. The result is a richly evocative portrait of the Cherokee that is destined to become the defining book on this extraordinary people. 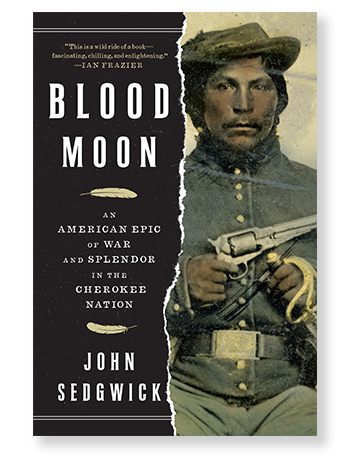 NPR, Here & Now's Eric Westervelt talks with Sedgwick about Blood Moon. The Battle of Pea Ridge turned against the Confederacy when two of its commanders wereshot dead by snipers within minutes of each other. 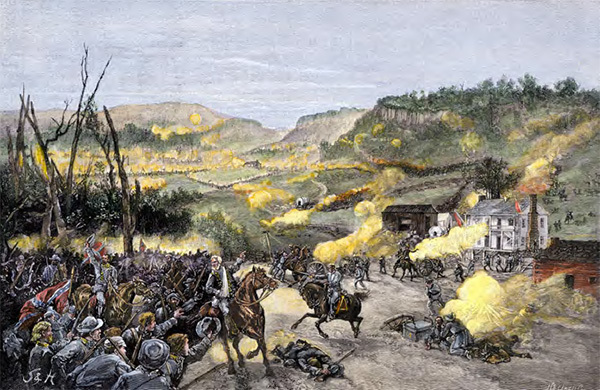 This etching depicts the last hour ofthe battle. 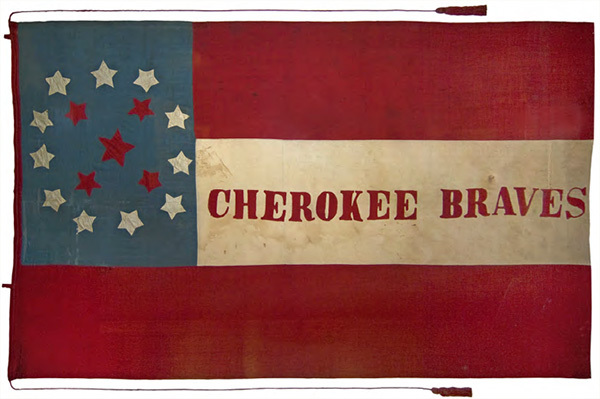 The flag of the Confederate Cherokee troops from the Battle of Wilson’s Creek. The Spanish conquistadors under Hernando de Soto were the first Europeans to lay eyes on the Cherokee. 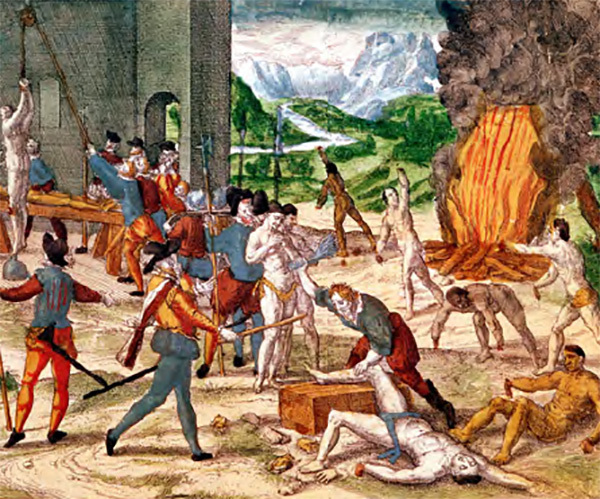 De Soto’s men enslaved hundreds, and tortured to death any they deemed unhelpful. This three chiefCherokee delegation metBritain’s King George III in1762. 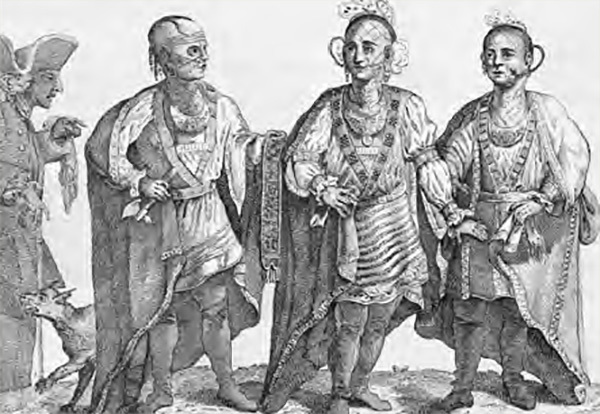 When Chief Ostenaco,pictured in the middle, encounteredthe novelist OliverGoldsmith at a social gathering,he gave the writer a tightembrace that left his facesmeared with face paint.